In this session we will discuss some special items that are also loved by many. 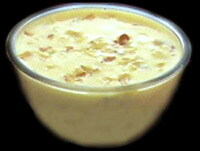 BAdAm khIr (KhIr means pAyaSam) is one such item. If prepared properly, it is very tasty but many do not know how to prepare especially in marriage when they serve. It will be so thin like water without any taste except the smell of bAdAm flavour. You have to search milk in it! There are people who add cardamom, pachchai kalpUram or other essences to mar the original flavour of almonds!! Let us see how we need to prepare this. *Charulipparuppu or Saraipparuppu as it is known in Thamizh, CharOli or ChirOnji in Hindi (Botanical name: ‘Buchanania Lanzan) is used in scented areca nuts, pAyaSams or in cakes, after fried in ghI. If pAyaSam is made from its paste adding milk, you should not take more as you feel giddy if consume more. For garnishing there is no problem. Soak the bAdAm nuts in piping hot water for ½ an hour with closed lid. Peel the skin thereafter and grind the nuts into a slight coarse paste but not nicely. Now take milk in a thick bottomed vessel and add the almond paste. Heat it to boil and keep stirring constantly. When it starts thickening, add sugar gradually and stir. Never add sugar all at a time to milk when it is boiling or hot as it will curdle the milk. Remove after the contents become thick and the entire sugar is dissolved. Now take a little milk separately and dissolve in it the saffron strands and add to the bAdAm khIr. Fry the piStA in ghI after breaking it into small pieces along with Charulipparuppu. Serve when chilled. Let summer arrive, all the north Indians prefer to drink this. This is also a delicious drink prepared from green mango. The preparation is very simple. The mango for this to be not too sour or too bland but moderate. Wash and clean the mangoes and boil them in water till the green skin turn yellowish green. Put off the fire and allow to cool. Peel off the skin and collect the flesh only by squeezing manually. Place this in a blender, add sugar, salt and the jaljIrA powder. 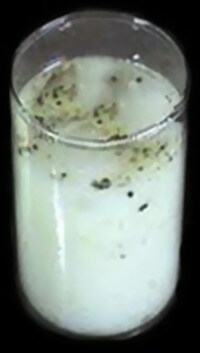 (Rock salt can replace the plain salt and pepper cumin powder can be used for jaljIrA if you like). Blend moderately so that the pulp bits are visible. Serve when chilled. 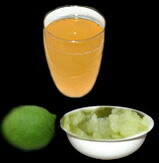 Never add ice to any juice as it will dilute it and mar its original taste. Just chill. 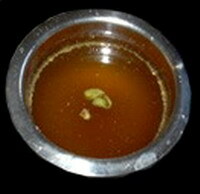 This a special item generally made on Ramanavami, New Year Day, navarAtri as well as on the day of Sumangali PrArtanai. It is very simple to make and digestive. Break jiggery into small pieces, put them in water and keep it aside for 10 to 15 minutes to dissolve. Stir well and strain to remove the impurities. Add other ingredients and mix well. Serve as it is or chilled. Along with PAnakam, this is also prepared and especially in summer to quench the thirst. The water content should be more in the butter milk as otherwise it will not be tasty. Wash the coriander leaves (and mint leaves if included). Cut the green chilli with ginger and add. Grind these into fine paste. Add water to the butter milk with salt, asafoetida powder and lemon juice. Add the above paste to this and mix well. Season it with curry leaves and mustard after shredding curry leaves into small pieces. Serve when chilled. If need be, you can add a little cumin and pepper powders too. This entry was posted on July 1, 2012 at 11:28 pm and is filed under Miscellaneous Specials with tags almond, asafoetida, Badam kheer, cardamom, charuli, chironji, coriander leaves, cumin seeds, curry leaves, ginger, green chilli, green mango, jaggery, jaljeera, lemon juice, milk, mint leaves, mustard seeds, neer more, pachchai kalpooram, panakam, panna, payasam, pepper, pista, pistachio, pudina, refined oil, rock salt, saffron strands, salt, saraipparuppu, sugar. You can follow any responses to this entry through the RSS 2.0 feed. Both comments and pings are currently closed.